A new coalition of scientists, indigenous peoples, community groups and lawyers is pushing for legal recognition of the rights of an endangered orca population living in the Salish Sea. The population, known as the Southern Resident Killer Whales, numbers just 75 individuals, down from 98 in 1995. The orcas are imperiled by noise and chemical pollution, the impending construction of Canada’s Trans-Mountain pipeline, and, most of all, severe salmon shortages caused by the damming of the rivers that feed into the sea. When Archduke Franz Ferdinand was assassinated in 1914, triggering the First World War, Granny was out under the sea half a world away, catching salmon and communicating with her pod in a signature dialect. She was doing the same when, in 1989, the Berlin Wall came down, and again in 2006, when the first tweet was sent. When she died in October 2016 at the ripe estimated age of 105, she was the oldest orca ever recorded. Following her century beneath the waves, Granny’s clan, a population of orcas (Orcinus orca) known as the Southern Resident Killer Whales, today teeters at a precarious near-30-year low. Just 75 Southern Residents split between three pods now survive in the Salish Sea, a strip of ocean stretching from the Canadian province of British Columbia to the U.S. state of Washington, down from 98 in 1995. After decades of piecemeal political action to save the whales, a grassroots coalition of scientists, community groups, lawyers and indigenous peoples has united to unveil a “Declaration on the Rights of the Southern Residents.” The declaration urges all levels of government to legally recognize the inherent rights of the cetaceans and the environment on which they depend. “Laws reflect our societal values, so it is about changing how we approach the Southern Residents’ recovery efforts … and giving the Southern Residents a true voice at the table,” said Elizabeth Dunne, a lawyer who helped draft the declaration and focuses on advancing the rights of local communities and ecosystems. According to the coalition, recognizing the legal rights of the Southern Residents would improve the health and management of their ecosystems, facilitate cross-border protection of the orcas as they swim between U.S. and Canadian waters, and enable much stricter environmental standards. The formation of the coalition comes after a tumultuous period for the Southern Resident orcas. In July, their plight reached international audiences when a whale named Tahlequah pushed the steadily decaying corpse of her newborn infant across a thousand-mile expanse of the Pacific for 17 days, in what onlookers termed a “tour of grief.” Shortly afterward, Scarlet, a 3-year-old female in the pod, also died, showing symptoms of emaciation. A Southern Resident orca pokes its head above the waves. These orcas belong to an endangered population in the Salish Sea, which spend much of their time in the coastal waters around Washington state and British Columbia. Unlike transient whales, Southern Residents are predominantly fish-eating, with exceptionally complex and close-knit social groups. Image by Ken Balcomb/Center for Whale Research. Once captured by the dozens for display in marine parks and circuses, the orca population is currently threatened by noise disturbance and pollution. But researchers believe the primary driver of their decline is the depletion of their main food source, Chinook salmon (Oncorhynchus tshawytscha) — a species also listed under the Endangered Species Act. To survive, the whales require a year-round supply of the once-plentiful fish, some 662 catches per day. The spring salmon runs down the Columbia and Snake rivers are particularly important, allowing the ocean giants to stock up prior to the leaner winter months. Scientists and conservationists view the dams blocking these spring runs as the major obstruction to feeding, and thus conserving, the orca population. In a memo sent to the Orca Salmon Alliance and provided to Mongabay, Orca Network co-founder Howard Garrett spoke in favour of immediately breaching four dams on the Lower Snake River. 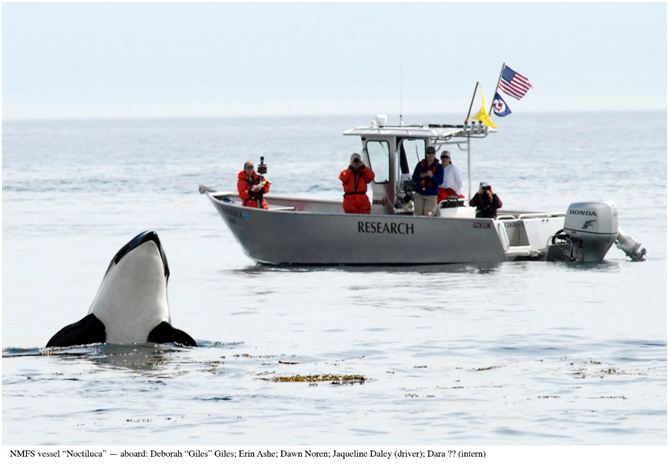 Researchers observe a Southern Resident killer whale. The Southern Residents are some of the most intensively studied mammals on Earth, with scientists able to differentiate individuals from the three pods based on their markings and coloration. Image by NOAA via Wikimedia Commons (Public domain). According to Garrett, getting rid of all four dams on the Lower Snake River would bring 1 million to 2 million additional adult Chinook into orca territory annually and revitalize 8,850 kilometers (5,500 miles) of tributaries for salmon spawning. He said it would take the U.S. Army Corps of Engineers two years to destroy the dams. An orca task force, established by Washington State Governor Jay Inslee, recently listed a series of recommendations intended to aid Southern Resident recovery efforts. These include a new agreement on how water is spilled at the Columbia and Lower Snake River dams that will try to boost the passage of young salmon through the dams, while lowering the cost to hydropower providers. The Bonneville Power Administration, which sells power generated from the Columbia River Basin dams, says it has lost $7.7 billion in revenues since 1981 due to measures to make dam operations more fish-friendly. But those supporting the declaration don’t believe the new agreement goes far enough. “While the governor and others may say that extinction is not an option, the reality looks much more like we value economics … over the orca’s right to life,” said Dunne. If the conversation were reframed to recognize the whales’ legal right to live, then “people [could] see that is actually a choice,” she said. Critics of the dams view current environmental laws as a political holdback to saving the orcas. Dunne said that yet more studies on the dams’ impacts following decades of litigation under the National Environmental Policy Act (NEPA) and Endangered Species Act were curbing the implementation of the very actions most likely to secure the Southern Residents’ future. A $33 million NEPA assessment of the Lower Snake dams, lambasted by some as a needless rerun of a 2002 evaluation, is currently underway. The declaration follows a growing wave of efforts to see the rights of species and ecosystems enshrined in law. More than 20 countries outside the U.S. now recognize the Rights of Nature, a legal framework that considers ecosystems as not mere property, but as having independent rights to flourish. San Francisco and Malibu both passed resolutions granting rights to whales and dolphins in 2014. “We know what needs to be done, but are being stifled from doing it with our current legal system. We need to implement solutions now, not later. We need to recognize the rights of the orcas before it’s too late,” Bender said. Researchers say they believe that engine noises from vessels, which have multiplied amid a boom in both tourism and commercial shipping off the coast, further threaten the killer whales. The underwater noises disrupt the orcas’ ability to communicate and hunt the dwindling fish population. Recent research suggests that halving this undersea cacophony while boosting salmon numbers by 15 percent would allow a 2.3 percent annual growth in the Southern Resident orca population. A hydroelectric dam on the Lower Snake River. Scientists consider dams such as these a major obstruction to the runs of Chinook salmon, the main food source of the Southern Resident orcas. Many conservationists, including members of the Declaration on the Rights of the Southern Residents, regard breaching these dams as a critical step to saving and restoring the endangered population of cetaceans. Image by U.S. Army Corps of Engineers. Pollutants are also leaking into the marine environment and traveling up the food chain, becoming concentrated in the blubber of the fish-eating apex predators. When the cetaceans become stressed, often when hungry, these fat reserves break down, releasing the toxic chemicals into their bloodstreams. Killer whales are capable of having babies every three years. But the current rate for the Southern Residents is closer to once every 10 years. 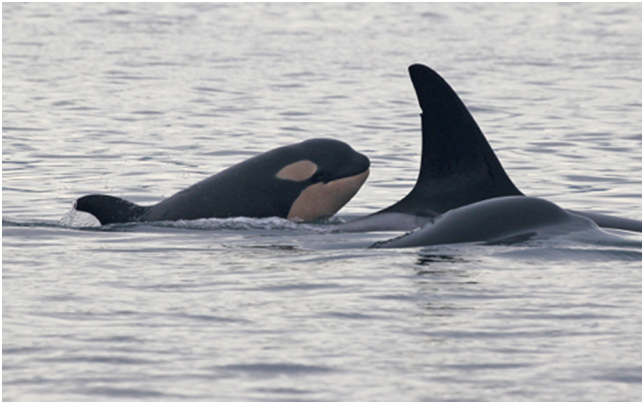 Moreover, up to two-thirds of Southern Resident orca pregnancies between 2008 and 2014 ended in a miscarriage, mostly due to too little food to sustain pregnancy. The birth of a new calf in early January, the first successfully born infant in three years, raises a glimmer of hope for the Southern Residents, who have long captured the hearts and minds of coastal and indigenous communities of the Pacific Northwest. “Southern Resident Orcas are a symbol of everything we value about this region — their beauty, power and fragility are the inspiration for our desire to protect this beautiful inland sea,” said Julia Nicholls of Save Our Whales. A Southern Resident killer whale calf follows in the wake of its pod. Image by Center for Whale Research. Orcas, both resident and transient, also provide an origin source story and spiritual totem for people of the Port Gamble S’Klallam Tribe (PGST), who are part of the coalition behind the declaration. A killer whale, or Kloomachin as it’s known, features on the tribe’s crest, and old stories recount a time when tribe members would ride on the backs of Kloomachin summoned from the north of Point Julia. Coastal Salish tribes on both sides of the U.S.-Canada border fear that the construction of Canada’s Trans Mountain Pipeline, formally greenlighted by Canadian authorities on Feb. 22, will once again menace orcas. The new pipeline will pump landlocked bitumen from Alberta’s oil fields to Vancouver’s coastline, to be sent onward to international markets. The resultant tripling in oil traffic shipments and the possibility of oil spills in the Salish Sea could prove the last straw for an orca population already teetering on the brink. “We should all be able to stand up for the species we love,” said the Earth Law Center’s Bender. With local activity advancing the legal rights of the Southern Residents in Pender and the San Juan islands, the coalition is imploring all individuals and institutions to act now by supporting the declaration. “Signing the petition is an important step toward changing the conversation from one which looks at how much harm we can cause before it’s too late to one which strives for healthy and vibrant ecosystems,” Dunne said. Orcas are among the most intelligent mammals on Earth, with sophisticated vocalizations and complex social groupings that can include up to four overlapping generations. 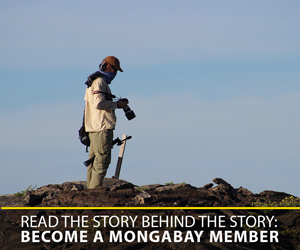 But for Granny’s once thriving clan, life beneath the waves hangs in the balance. Lacy, R. C., Williams, R., Ashe, E., Balcomb III, K. C., Brent, L. J., Clark, C. W., … & Paquet, P. C. (2017). Evaluating anthropogenic threats to endangered killer whales to inform effective recovery plans. Scientific reports, 7(1), 14119. Wasser, S. K., Lundin, J. I., Ayres, K., Seely, E., Giles, D., Balcomb, K., … & Booth, R. (2017). 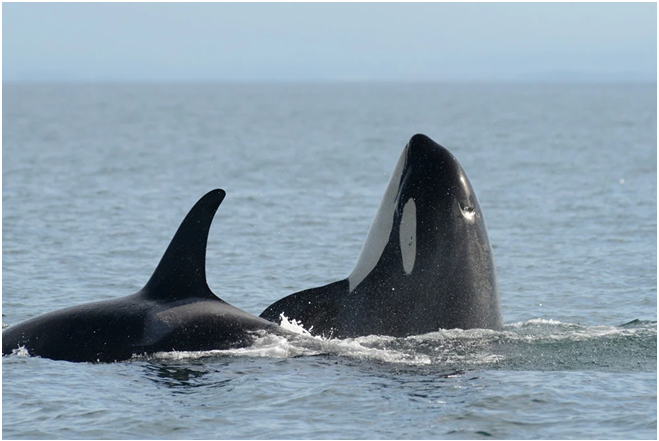 Population growth is limited by nutritional impacts on pregnancy success in endangered Southern Resident killer whales (Orcinus orca). PLoS One, 12(6), e0179824.